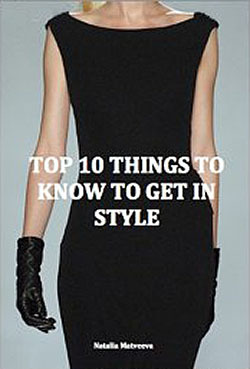 Natalia Matveeva is a qualified personal stylist, founder of ‘Style-And-You’ and Amazon published author of ‘Top 10 Things to know to get in style’ book. Natalia is on a mission to empower people to shine with confidence and reach their full potential through their personal style presentation. Having worked as a professional stylist in Russia and the UK, Natalia earned her credibility through extensive experience working with corporate and individual clients. She has the advantage, insight, knowledge and good understanding of customers’ needs and knows how to help them create a winning personal image – to be successful in business, career and life. Natalia now works in Australia using her knowledge of European fashion and style to create the most attractive collection of clothing to help her clients look and feel fantastic. Her clients often say that with her help not only do they look great on the outside, but, most importantly, they feel fantastic on the inside inside, as they have gained increased confidence through their improved appearances. Natalia knows what it takes to stand out! Her lifelong passion and confidence is to help every person have a unique, creative, elegant and timeless look – no matter their budget or lifestyle. Natalia is a regular contributor and supporter of the registered charity ‘Dress for Success’ that assists women in need achieve self-sufficiency, financial independence and improve their employability by increasing confidence and restoring dignity.